It was suggested to me yesterday that I post something here about Kim Thompson's death. I don't know why -- I never met or had any interactions with him, and I'm fairly confident I've never even given the impression I had. I have in my collection exactly 70 books from Fantagraphics... which is six fewer than I have from the gone-for-almost-three-decades Pacific Comics. Fantagraphics accounts for about ½% of my collection. I can talk about Thompson or Fantagraphics from a removed third party perspective, but it would sound like a press release. I have nothing to say about the topic that would enhance anybody's understanding or appreciation. Thompson's death is tragic, and I appreciate what he did for comics, but people like Tom Spurgeon, who actually worked for him, can provide much more poignant and touching comments. 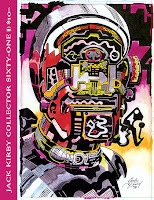 What I do with all my writing, whether that's here or on MTV Geek or for Jack Kirby Collector or wherever, I try to avoid saying the same things everyone else is saying. Even with the link-bloggng I do on Wednesdays, I try to pull out links that haven't already shown up on The Beat, CBR and Comics Reporter. You can get all that from them, so why would anyone bother coming here if I'm just tossing off the same stuff? I was talking with someone a few years ago about... I think it was the latest iteration of Hawkman. I hadn't read the new material but he clearly had, and went on for a bit about why the changes they had just made were bad ideas, and why the pairing of that particular writer and artist would never work well, and whatever other criticisms he had. As I said, I hadn't read the series, so I can't speak to the validity of his commentary, but what struck me was that it wasn't his commentary. I had known this guy for years, and the types of complaints he was making weren't typically the types of concerns or problems he notices in comics. In fact, they sounded a lot like the types of comments I used to hear from the manager at the LCS where I had used to frequent. The same LCS where I knew he still went every week. The complaints he was lodging against Hawkman weren't his -- he was just parroting what he'd heard the LCS manager say. To be fair, he understood the complaints well enough to detail and expand on them probably more than what the LCS manager would have in the course of a transaction at the shop itself, but it was the origin of the complaints that weren't his own. If I were still going to that LCS, I would've had the same discussion with that manager that I was now having with my friend. That's what I don't want my writing to be. I want my thoughts and ideas to be my thoughts and ideas. I'm willing and happy to respond to news items or commentary or whatever, but only if I have something to say that isn't parroting anyone else. I'm not trying to be a news outlet here -- I'm not interested in doing that, nor am I very good at it -- and I'm not concerned about creator shuffling and costume chnages, or how well the movie interprets the source material. I have my interests, and my comments here reflect that. Jack Kirby used to tell aspiring artist not to emulate him; no one could be a better Jack Kirby than Jack Kirby, but no one can be a better you than you either! He told people to find their own voice and do their own thing. I don't have anything substantive to say about Thompson, just like I have nothing substantive to say about Man of Steel or the latest issue of Uncanny X-Men or Brian Michael Bendis. I pass no value judgement on folks who are interested in those things, but since I'm not, I'm not going to waste anyone's time with trite commentary that you can get any number of other places, often in a more sincere form. If there's something you'd be curious to hear my opinion on, by all means, ask away. But if I don't have anything new to add to the broader conversation, it might not be much more than, "Yeah, I heard about that." Who's Appeared In Comic Book Movies The Most? How Do The FF Pay For All That Stuff? There's Another Superman Movie Coming Out?